Centrally positioned on a charismatic street in De Waterkant, guests at Loader Street Apartment will have the vibrant city of Cape Town at their finger tips. This self-catering apartment has a stylish interior with a lounge, a fully fitted open-plan kitchen, and two en-suite bedrooms with a variety of luxury amenities. Outside is a small courtyard, and a large roof deck perfect for enjoying breakfast while taking in the stunning views of the city, the Waterfront and Table Mountain. Visitors can take a walk and visit the many intricate and eclectic shops and restaurants, with a mixture of clubs to spice things up. 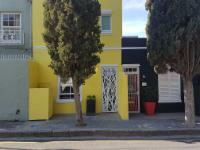 One will feel safe and at home in De Waterkant, with its old-world architecture and looming presence of Signal Hill. A deposit of 50% is due within 8 days of the reservation. The remainder is due on the day of check-in. Payment can take place by credit card through Payfast, by Electronic Fund Transfer or in cash. For the comfort of our guests, Purple House on Jarvis is a non smoking accommodation establishment. Smoking is allowed on the patio and the roof terrace. Purple House on Jarvis does not accept any liability for loss of or damage to any valuables or property belonging to guests or their visitors. It is therefore the sole responsibility of all guests to make arrangements for adequate insurance coverage on all valuable items prior to arrival at Purple House in Cape Town. This includes but is not limited to, photographic equipment, laptops or other electronic devices, jewellery, cash and vehicles. While every care is handled by Purple House Bed and Breakfast to ensure the safety of guests and their possessions while enjoying our accommodation, Purple House B&B does not accept any liability in the event that any loss or damage to persons or property is experienced by a guest. Should Purple House on Jarvis suffer any loss or damage as a result of an act or omission by a guest or visitor of a guest, the guest will remain liable for full reimbursement of such loss or damage incurred and will be billed accordingly. Stayed for two nights and really enjoyed the apartment and the roof terrace (though a really challenging stair with kids)Apartment a bit dark but very nice, area is nice and walking distance to a lot.Great hosts, very friendly and good suggestions for eating. Loader Street Apartment is 1.3km from the centre of Cape Town , the nearest airport 21.1km (Cape Town International Airport).